For the past eight years, what I refer to as the Financial Establishment—large banks and Wall Street firms, and their advocates and alumni at Treasury and elsewhere—has been engaged in a well designed, carefully scripted and highly orchestrated political campaign to convince Congress to replace Fannie Mae and Freddie Mac with a mechanism more financially beneficial to themselves. Then, seemingly out of nowhere, five weeks ago Treasury Secretary-designate Steven Mnuchin announced his intention to “get [Fannie and Freddie] out of government control…reasonably fast.” With this statement, the odds immediately flipped to favor the prospect that the fates of Fannie and Freddie will be determined not by a misinformation-based political process likely to benefit banks, but by a fact-based economic process likely to benefit borrowers. Banks’ battle for control of the U.S. residential mortgage market began in earnest in the late 1990s, following a decade of concentration of assets and mortgage originations in that industry. Large banks saw Fannie and Freddie’s activities in the secondary market—principally their underwriting standards and the impact of their guaranty fees and mortgage-backed security (MBS) yields on mortgage rates—as constraints on banks’ flexibility to customize and price their mortgages in the primary market. In 1999 three large banks, one subprime lender and two large mortgage insurers banded together to create and sponsor a lobbying group called FM Watch, whose purposes were to put out information depicting Fannie and Freddie in as negative a light as possible, and to lobby Congress for changes to the companies’ charters to raise the cost and restrict the scope of their business. FM Watch had relatively little success in its efforts, however, in large part because they so transparently served banks’ interests at borrowers’ expense. The 2008 financial crisis provided Treasury with a serendipitous opportunity to accomplish what the large banks and FM Watch could not. Under pretense of a rescue, it forced Fannie and Freddie into conservatorship, against their will and without statutory authority, and deliberately withheld from them the onerous terms that would be imposed in the aftermath, which were intended to prevent them from ever returning to private, shareholder-owned status. The takeovers of Fannie and Freddie in 2008 were accompanied by an aggressive and highly coordinated disinformation campaign that was far more ambitious and audacious than anything attempted by FM Watch. Using the technique of “fake facts” that since has become a standard weapon in the political arsenal, members and supporters of the Financial Establishment ignored the obvious evidence—including the disastrous credit performance of loans financed with private-label securities and the vastly lower delinquency numbers put out by Fannie and Freddie each month—and simply blamed Fannie and Freddie for the crisis. With that, they had a mantra they could repeat endlessly: Fannie and Freddie had a “flawed business model;” they (alone) caused the financial crisis, and it had taken $187 billion in taxpayer money to paper over their mistakes. The Financial Establishment also had a proposed remedy: the companies must be “wound down and replaced,” with whatever secondary market mechanism it recommended. This complete misrepresentation of the causes of the crisis—and the appropriate response to it—encountered virtually no resistance or opposition. That, too, was by design. One of the conditions imposed by FHFA on Fannie and Freddie, in writing, on the day they were put into conservatorship was that “all political activities—including all lobbying—will be halted immediately.” The executives at Fannie and Freddie had the most knowledge about the true causes of the crisis, but with the FHFA edict their voices, and those of the consultants and lobbyists they employed, were silenced. And when discussions on mortgage reform began in Washington in 2009, it was understood even by the independent think tanks that in order to have a “seat at the table” you had to accept as a given that the mortgage finance system of the future would not include Fannie and Freddie, or any entity that looked or functioned like them. The mortgage reform debate in Washington should have been an economic exercise in how best to apply the lessons from the housing bubble and subsequent meltdown to make our mortgage finance system safer and more resilient, while maintaining its accessibility and affordability for consumers. Instead, it became a political exercise in deliberately misstating and distorting those lessons, to justify giving control over the availability, terms and pricing of $10 trillion in mortgages to the large banks and investment firms. Large bank mortgage originators in the primary market have long known that the most sure way to minimize the constraints and disciplines imposed upon them by credit guarantors in the secondary market is to make those guarantors less efficient by forcing them to hold (and price for) more capital than is warranted by the risks they insure. Thus, the one consistent element in every reform proposal made or endorsed by the Financial Establishment has been that any entity or mechanism that replaces Fannie and Freddie must have bank-like levels of capital backing its credit guarantees. Advocates for this position advance two politically powerful arguments to support it: to create a “level playing field” for all competitors, no form of financing mortgage credit risk should have a lower capital requirement than any other, and “more capital is better” because it keeps the taxpayer safer. Economically, however, a single, artificially high capital ratio applied to the entire range of credit risks for all single-family mortgages made throughout the country violates the principle that capital must be related to risk, and cripples the credit guaranty business model (which the Financial Establishment understands). For example, a 5 percent fixed capital ratio requires a credit guarantor to charge an average annual guaranty fee of between 80 and 90 basis points (before the 10 basis point payroll tax fee paid to Treasury) to earn a market return on its capital. To average an 80 to 90 basis point fee rate on the mortgages being made today—which have an expected annual loss rate of less than 4 basis points—a credit guarantor would need to significantly overcharge for most of its guaranteed loans, and grossly overcharge for higher-quality loans. Borrowers would be badly hurt by those pricing distortions, while banks and Wall Street firms would profit from them. Interest rates on 30-year fixed mortgages are based on the cost of selling into MBS, so any increase in average guaranty fees would be passed on directly to borrowers. Let’s say that excessive capital requirements result in 40 basis points of “unnecessary” guaranty fees. On average, mortgage borrowers would pay that amount, while portfolio lenders would receive it. Commercial banks today hold $1.7 trillion in single-family first mortgages in their portfolios (up 9 percent from a year ago); a 40 basis point rate increase rolling into them, as old loans pay off or refinance and new ones replace them, would raise banks’ net interest income by almost $7 billion per year. Higher 30-year fixed mortgage rates, over time, also would lead more borrowers to choose adjustable-rate mortgages—which banks can match with their short-term deposits, with borrowers bearing the risk of interest rate adjustments—and, for Wall Street firms, would make private-label securitization more competitive with (overpriced) guaranteed MBS. Finally, 40 basis points more in mortgage rates and 80 to 90 basis point guaranty fees would allow banks to increase their interest income and reduce their credit losses by keeping their lower-risk mortgages in portfolio (funded with low-cost, government-insured deposits) while swapping and selling their higher-risk mortgages as guaranteed MBS. Now, however, comes Mnuchin’s pledge to resolve the impasse over Fannie and Freddie “reasonably fast,” which decisively changes the reform dynamic. In an administrative process, responsibility for accomplishing mortgage reform shifts from a large number of misinformed members of Congress with political incentives to get it wrong to a small number of informed finance professionals with economic incentives to get it right. Moreover, the deceptions, inventions and falsehoods about Fannie and Freddie that have served the Financial Establishment so well in the legislative process will work against it in an administrative process, where the focus will be on facts produced in the course of judicial proceedings. A key element of Treasury’s strategy of blaming Fannie and Freddie for the financial crisis was to bury them under a mountain of non-repayable senior preferred stock by directing FHFA, as conservator, to put massive amounts of non-cash expenses on their books. But because the resulting losses were not real, there was nothing FHFA or Treasury could do to keep those losses from reversing. Between the fourth quarter of 2012 and the first quarter of 2014, most of them did. Recognizing that this was about to happen, Treasury and FHFA entered into the net worth sweep in August 2012, preventing the companies’ from rebuilding their capital by taking all of their future income for the government. Treasury’s public defense for the sweep was that it was in Fannie and Freddie’s own best interest, to avoid their entering “death spirals” of borrowing to pay the dividends on their senior preferred stock. Treasury had gotten away with countless dishonesties about the companies before, but this was too much. Numerous lawsuits were filed challenging the legality of the sweep (with one challenging the conservatorship) in several courts under different theories of law. The judge in one of the courts—Margaret Sweeney in the U.S. Court of Federal Claims—granted plaintiffs requests for discovery. From this discovery, documents have slowly emerged, and more are in the process of being compelled, that make clear that far from rescuing Fannie and Freddie, Treasury planned and carried out their takeovers for ideological and policy reasons, then lied to both the public and the courts about what it had done and why. Plaintiffs in the court cases have had three and a half years to learn the facts about what really happened to Fannie and Freddie. Mnuchin’s plan to “get [the companies] out of government control” requires settling the lawsuits, and when settlement talks begin he, and the rest of his (new) senior Treasury staff, will learn those facts. Just that quickly, eight years of investment by the Financial Establishment in a fictitious account of the mortgage crisis, and a mythical depiction of Fannie and Freddie, will lose its influence. Fiction only has power where facts aren’t known. The fact-based settlement discussions between plaintiffs in the lawsuits and senior economic and financial officials in the Trump administration also will set the tone for how the parties think and decide about what the post-settlement secondary market system should look like, and how it should function. Plaintiffs know that Fannie and Freddie were not the causes of the financial crisis, that they didn’t need to be rescued by the government, and that their secondary market business model works better than any other. They also know that because the alternatives to Fannie and Freddie proposed by the Financial Establishment are deliberately designed to be inefficient, it would be impossible to raise the requisite amount of capital to set them up (a point continually missed by advocates of these alternatives), whereas recapitalizing Fannie and Freddie post-conservatorship is eminently achievable. Plaintiffs emphatically will make these points, and others, to Mnuchin and his team. In an administrative reform process, plaintiffs and the government each will have powerful economic incentives not just to reform, release and recapitalize Fannie and Freddie, but also to set them up to succeed. Plaintiffs know that Fannie and Freddie have much more value as ongoing entities than in liquidation, and both Bruce Berkowitz and Bill Ackman have said repeatedly that “there is no alternative” to the companies. For its part, the Trump administration will have at least two reasons to support them. First, it will understand from facts unearthed for the lawsuits that a secondary mortgage market built around Fannie and Freddie is far better for consumers and the economy than the bank-centric proposals supported by the Financial Establishment, and will know it will be held accountable for the negative consequences of choosing the latter. Second, the Trump Treasury will inherit the warrants for 79.9 percent of Fannie and Freddie’s common shares created by the Bush Treasury, which will become worthless if the companies are wound down. While the Trump Treasury could (and should) cancel those warrants on the grounds that they were granted improperly, their financial value makes this unlikely. And as warrant holder, the Trump Treasury will share the plaintiffs’ goal of setting Fannie and Freddie up to operate as cost-effectively and efficiently as possible (benefitting borrowers as well as shareholders). It also will have strong incentives to alter the terms of the warrants—their strike price, percentage amount or both—and to manage the timing of conversions so as to maximize the value of all three categories of stock the companies will have as going concerns: existing shares, converted warrants, and the new issues of equity required for recapitalization. Plaintiffs, the Trump administration, existing shareholders and borrowers will be aligned around common objectives. Members and supporters of the Financial Establishment will fiercely oppose an administrative solution to mortgage reform that maintains Fannie and Freddie—indeed they’ve already begun to do this in the media—but they will be dealing from a position of weakness. They have no realistic legislative alternative to offer, and because Republicans in the executive branch will know the facts about Fannie, Freddie and the financial crisis from discovery in the court cases, Republicans in Congress will not be able to sustain their myths about them. There never has been any economic case against reforming, releasing and recapitalizing the companies, and without the myths the political case falls apart. It is by no means a certainty that the Trump administration will arrive at the right solution on mortgage reform. But because it has made the issue a “top ten” priority, and the path to a successful outcome is so obvious and wide open, for the first time in quite a while there is great cause for optimism. My favorite fact for my students about the “bailouts”… it was a decision made by GW Bush, Obama AND John McCain TOGETHER. Is that not unprecedented? Are not these views favorable to FnF as a large FIs involved in traditional financial activities? I believe that banks that have FDIC insurance should be appropriately regulated. However I believe in a regulatory framework that is determined by complexity and activity, not simply size. I endorse rethinking regulatory requirements facing large regional banks in order to regulate the banking sector in a more effective manner. In particular, we should examine whether it is appropriate for financial institutions that engage almost exclusively in traditional banking activities with consumers and businesses to be subject to measures intended for our largest and most complex financial institutions. The general principal of “a regulatory framework that is determined by complexity and activity, not simply size” can certainly be read as favorable to Fannie and Freddie, and consistent with the application of a custom-tailored risk-based capital standard to their credit guaranty business. I also agree with Mnuchin’s notion that it ought to be possible to ease the regulatory burden on large regional banks. First time poster here. Thoughts on this? Fannie Mae’s Connecticut Avenue Securities Receive Top Honors from Risk Magazine. Are they just ignorant to the structure of the CAS? Thank you good sir! I would suspect that, yes, the editors of Risk magazine are unaware that Fannie’s Connecticut Avenue Securities do not transfer any meaningful amount of credit risk to the buyers of the risk-sharing tranches. But it’s understandable how that might be the case. I doubt that anyone at Risk magazine ever has read through the 200-plus pages of Fannie’s prospectuses on these deals, and even if they have they likely did not spend any time looking at and comparing the various risk sensitivity disclosures to determine how the tranches actually work (or don’t work). More importantly, there has not been a peep from anyone in the financial press about how ineffective CAS are at transferring credit risk. As I’ve noted in previous comments, I’ve brought this fact to the attention of over a dozen journalists and security analysts, and so for none have written a word about it, even though none of them have told me my analysis is in error, and therefore they must believe that my claims about CAS (and Freddie’s STACRs) are true. Hi. I’m the editor of Risk magazine. You’re right – we didn’t read the CAS prospectuses. We spoke to Fannie, a selection of investors and banks; and read the FHFA reports on the risk transfer programme. On the face of it, I don’t see why Fannie would overpay for these deals if next to no risk is being transferred – nor why the FHFA would be waving them through. But we could always be missing something – please drop me a note when you have a sec. I was not meaning to be critical of either you or your magazine. I myself did not read the prospectuses for Fannie’s CAS deals until nearly five months after I first did a post about them (and only then because I was trying to understand how risk-transfer securities worked in general; I had no expectation of finding how inefficient the CAS structures actually are). And I totally understand your question as to why Fannie would be overpaying to issue securities that transfer virtually no credit risk, or why FHFA would be approving these securities. Fannie is not doing this of its own volition (nor is Freddie Mac with its STACRs program), while FHFA is not acting independently either. Both Fannie and Freddie were forced into conservatorship in 2008 by the U.S. Treasury Department, which has made no secret of its goal of “winding down and replacing” them with a secondary mortgage market mechanism that relies more directly on private capital. Treasury has been the primary advocate of these risk-sharing transactions (and it is entirely possible that IT doesn’t understand how inefficient they are). While Fannie and Freddie remain in conservatorship, Treasury is requiring FHFA to set risk-transfer goals for the companies, and they in turn feel they have to do what their regulator and conservator, FHFA, tells them to. I know that seems bizarre (and possibly not even believable), so let’s start with the CAS structures themselves. I will send you an email shortly, identifying the tables in the Fannie prospectuses that you can consult to assess their effectiveness (or lack thereof). Once you’ve done your own analysis of the CAS deals—and I’m confident you’ll reach the same conclusion about them as I have—we can discuss why we think it is that the inefficiency of Fannie’s CAS and Freddie’s STACRs has been kept a secret for as long as it has. I had not been aware of Fannie’s Blackstone transaction until yesterday. The author of the article in “Zero Hedge” (to which you’ve linked) obviously doesn’t like it. From my perspective, however, it has precedence in a general sense from a mission standpoint and seems solid from a risk perspective, but I’m in the dark on the decision process that led this particular transaction to be approved at this time. Fannie has long supported rental housing through its multifamily programs. So to me it’s not a stretch for Fannie to support rental housing on the single-family side if it’s presented with an opportunity that it feels makes sense economically, and is politically defensible. From what I’ve been able to learn, the Blackstone transaction very likely does make economic sense: the single-family mortgages Fannie is guaranteeing have very low loan-to-value (LTV) ratios, and were originated some time ago (and thus have current market value LTVs even lower than their origination LTVs). Moreover, Blackstone will be taking the first 5 percent of losses on the loans before Fannie has any exposure at all. Fannie is effectively providing a re-insurance “wrap,” at miniscule risk of loss to itself (for which I would guess it is charging a fairly modest fee). All of which raises the question: why this (Blackstone) transaction, and why now? When I was at Fannie, we would subject any proposed new type of deal to an extensive political analysis—who would be for it, who might be against it (and why), what sort of precedent would it set, and so forth. Weighing all these considerations, we’d decide either to go ahead with it or not. I’m sure the same sort of conversations took place in this instance, only this time it would have been among senior officials at Treasury and FHFA, since Fannie or Freddie management is not allowed to make decisions like this on their own. I believe that the author of the “Zero Hedge” piece is correct that the Obama administration Treasury “green-lighted” this deal, but I have no insight into its motivation for having done so. the interesting thing about the warrants is that while they represent significant value that, i imagine, the trump administration will not want to forgo, realizing upon that value by exercising for common stock is slow and acts as a overhang that restrains any GSE recapitalization issuances of new equity. is there any reason that you know of why a trump treasury could not sell those warrants back to the issuer in exchange for a certain amount of GSE debt secured by portfolio mortgages. remember, jumpstart language is addressed only to senior preferred stock. this secured debt likely could be resold by treasury in the debt market quite easily. given its secured status, the interest rate born by this debt should be low. this would provide great execution by treasury in realizing value, and should clear the overhang represented by the warrants that would facilitate GSE capital increases by equity issuances. a win/win. we do know trump likes to win…. In theory, a transaction such as the one you describe could work. In practice, it would depend on the legality, the accounting and the economics. The legal aspect is that I don’t know whether Fannie and Freddie today, in conservatorship, would be allowed to use existing mortgages held in portfolio to collateralize issuances of debt for which the companies receive no proceeds. (That’s an answerable question; I just don’t know the answer.) I also don’t know how the issuance of debt with no proceeds– which effectively is a promise to pay a fixed amount of money at the maturity date of the debt issue–would be accounted for. Would it be expensed immediately? Would it be treated as a payable? Or is there some other treatment the accountants would use? (If I were still at Fannie, I’d just go ask the auditors.) Expensing the debt repayment obligation immediately would dig Fannie and Freddie’s capital holes that much deeper right away, and could be a non-starter. Then there are the economics: what’s an acceptable price to the companies (paid to Treasury in secured debt it can sell quickly) for cancelling the warrants? Ten billion? Twenty billion? More? Assuming that issuing secured debt doesn’t violate some regulations or covenants, and that you can defer taking a hit for the principal repayments until the debt issues mature (you’d probably want to stagger them), whether this type of transaction makes sense comes down to the asking price, and Fannie’s and Freddie’s assessment of what their best alternative is (as you point out, leaving the warrants outstanding creates obstacles for Treasury as well as the companies). As I always find when I’m asked to handicap the feasibility or probability of any one suggested solution to the reform, release and recap problem, there are too many moving parts and imponderables to give anything close to a definitive answer. But the basic idea of taking a known hit for the warrants, then moving forward to maximize the speed and efficiency of recapitalizing the companies is a good one. Vista Capital Advisors, working with several major banks, is planning on introducing a new type of derivative backed by Credit-risk transfer notes issued by the GSEs. I thought it would be a good idea to get your opinion on this new type of derivative product. There are no specifics on how this CRT-based derivative would work, so I can’t at this point say anything definitive about it (once there are details on what the derivative structure is and how it works I’m sure I’ll have an opinion, and will be happy to share it). In general, though, the idea of a derivative based on Fannie and Freddie’s risk-sharing tranches of CAS and STACRs fills me with more trepidation than hope. As I’ve discussed at some length, the CAS and STACRs that Fannie and Freddie currently are issuing are a terrible waste of money for them, and therefore a tremendous deal for investors. In theory, such market asymmetry shouldn’t happen– prices of these securities should be bid up, and yields reduced, until they provide a fair return for the risk taken. I believe the reason this hasn’t happened with CAS and STACRs is that capital markets investors simply do not know how to think about, and therefore fairly assess, the underlying credit risk of these securities. If that in fact is the case, then a derivative based on the securities would provide a great opportunity for the “smart money” to make high and certain profits at the expense of less savvy investors. This, you might recall, is what happened with synthetic collateralized debt obligations (CDOs) in 2006 and 2007, and that episode ended in disaster. I’ll withhold judgement on CRT derivatives until I see what they actually look like, but I can’t say I’m optimistic about them. Did you provide your views on request for public input from FHFA? No; I have not filed a comment in response to these requests, and am not intending to. Admittedly I am only half way through your book (which is fascinating btw). I have gleaned that the political headwinds for FnF seemed to be at their strongest when Treasury, the Fed and OMB were all aligned against FnF. It appears as though Mnuchin and OMB appointee Mulvaney are sympathetic, but what of Yellen? Any idea which way she leans? If in opposition, how much can she do to disrupt progress, and if in favor, what kind of value does she add? Besides the FE and their lobbyists, are there any other political groups negatively in the mix? Your book has shed light on the fact that besides the obvious financial agenda by the FE, that political adversaries are created frequently by misinformation perpetuated by those with ideological differences. But even the ideology may not be based on the facts regarding FnF business, in particular the risks and pursuit of the mission of the charter. It also dawns on me that no one can really have a true understanding outside of those who actually run the DTD activities of such a complex business. Just because it is tied to the government does not mean that anyone from the government actually has a full grasp of what is going on. I look forward to reading the rest of your book. I can’t thank you enough for writing it and for your dedication to the best interests of America. The opposition of the Federal Reserve to Fannie and Freddie in the 1990s and 2000s was largely the product of the ideological position against them taken by Alan Greenspan, who was Fed Chairman between 1987 and 2006. Greenspan’s successor, Ben Bernanke, did not deviate significantly from Greenspan’s positions on the companies, but I did not perceive him to be nearly as committed a critic or detractor of Fannie or Freddie as was Greenspan. One Chairmanship further removed from Greenspan, Janet Yellen, Bernanke’s successor, has been even less outspoken about the companies. Her primary comments have been to encourage Congress to resolve their status, as illustrated by her 2014 statement to the House Financial Services Committee that “it’s important for Congress to put in place a new system and to explicitly decide what the role of government should be in helping the housing sector.” She seems to be willing to let others take the lead in determining both what that system should look like and the degree of government involvement it has. For that reason, I believe that if Treasury Secretary Mnuchin devises a proposal for bringing Fannie and Freddie out of conservatorship, reforming them—with updated capital standards, and possibly utility-like return limits—and recapitalizing them, I doubt Yellen would take a strong stand against it, or indeed oppose it at all. But I wouldn’t expect her to take an active role in supporting it either. The lobbying lineup for and against Fannie and Freddie is fairly straightforward. Groups whose membership is dominated by the largest financial firms—such as the American Bankers Association, the Mortgage Bankers Association and the Financial Services Roundtable—support a bank-centric outcome for mortgage reform; groups representing smaller, community-based lenders or affordable housing constituents are supportive of a solution that maintains a large role for Fannie and Freddie. Large and seemingly neutral lobbying organizations, such as the National Association of Realtors or the National Association of Homebuyers, tend to side with the big financial services trade groups, primarily because these bigger groups have the political clout to help them (the NAR and NAHB, and others) on the issues their members care most about, and they wish to maintain their allegiance. Thanks, This provides good situational background for FnF. FRBs (private) seem to be owned and controlled by member banks. Tsy appointees also mostly come from member banks. So there seems to be strong advocacy group in Gov working for banks that will undermine any outside competition for banks. AGAIN, THANK YOU FOR THAT. UNLIKE THE MEDICARE FUND WHERE I ACKNOWLEDGE I AM NOT AN EXPERT, ON FANNIE MAE AND FREDDIE MAC, I THINK I AM AN EXPERT. I HAVE BEEN AROUND THESE FOR YEARS, I UNDERSTAND VERY WELL. THAT IS WHY IT WOULD BE ONE OF MY PRIORITIES TO WORK WITH YOU. AS I HAVE SAID, WHAT I AM FOCUSED ON IS WE NEED HOUSING REFORM AND A SOLUTION. I START WITH THE STANDPOINT THAT THE STATUS QUO IS NOT ACCEPTABLE, OF JUST LEAVING THEM THERE. I THINK AS YOU KNOW AND WE HAVE DISCUSSED, THERE ARE TWO EXTREMES ON THIS. IT IS SOMETHING I LOOK FORWARD TO SITTING DOWN AND TALKING YOU WITH. WE NEED HOUSING REFORM AND NEED TO MAKE SURE THAT WHATEVER THE OUTCOME IS, ON THE TWO EXTREMES, THAT ONE, WE DON’T PUT THE TAXPAYERS AT RISK, AND TWO, WE DON’T ELIMINATE CAPITAL FOR THE HOUSING MARKETS. I AM VERY CONCERNED THAT MIDDLE-INCOME PEOPLE AND MODERATE-INCOME PEOPLE WHO NEED MORTGAGE LOANS HAVE ACCESS TO THE CAPITAL. Mark Warner wanted him to listen to Congress. He said he was an expert. He can wait. But if no consensus from Congress in near future? In addition, he and Watt can do certain things without any new laws. You can’t fault Mnuchin’s twin objectives for housing reform, and I believe he has ideas for how to accomplish them. He will discuss and test these ideas with both the plaintiffs in the lawsuits and key Senators and Congressmen on the Hill. Based on the statements I’ve heard from Mnuchin to date, I think his goal is to achieve a political consensus on the best way to achieve housing reform. But if he has to choose between political consensus and workable reform (as I suspect he will), my bet is that he’ll pick the latter, and seek to achieve it administratively. i agree that mnuchin likely will act cautiously and respectfully, sounding out congress more out of prudence than necessity. he has already made it clear that he considers himself a GSE expert, so i dont think he thinks he needs to be educated by congress. indeed, crapo said that the GSEs were in receivership in mnuchin’s hearing, and this from a guy who co-sponsored a GSE reform bill! if cooper does become SG, he will not be able to work on perry or fairholme while in DOJ, but his presence will have an effect, i have little doubt. No, I don’t believe that Cooper’s relationship with Sessions or his being on the “short list” for solicitor general has been mentioned on this blog; thanks for doing that. It’s certainly relevant, whether Cooper gets the SG post or not. Completely apart from the congressional politics, and in an IDEAL world, do you think the portfolio aspect of Fannie’s business model is vital to enhancing security of the whole? After all, vanilla Insurance companies RELY on investing their premiums into return earning assets (stocks/bonds) as a VITAL part of their actuarial commitment (I believe they call it the “surplus”, which helps lower premiums). (I do understand that there’s a LOT of chatter out there from people of “standing” about nixing it as being most risky; and that, consensus has crystallized on nixing the portfolio; but having read your book, i am wondering if those people of “standing” who have more than proven themselves inept, in hindsight, via the deregulated run up to the 08 crisis, may have it WRONG entirely?). This is a good question that has no simple answer. But let me take a stab at it, while keeping it as brief and as understandable as I can. First of all, I think Fannie and Freddie’s portfolio businesses HAVE played useful and valuable roles in making large volumes of fixed-rate mortgage credit available to a wide range of borrowers at low cost. There are many natural buyers of agency fixed-term debt (including the insurance companies you mentioned), whether that debt is callable or non-callable. Fannie and Freddie used their debt in an intermediation process; the companies monitored the spreads between their debt costs and the yields on fixed-rate mortgages and MBS, and when those spreads widened out beyond a certain point, they issued debt to the investors who wanted to buy it, and used the proceeds to buy mortgages and MBS. That act of issuing debt and buying MBS, on a large scale, brought MBS-to-debt spreads back down, at which point the companies slowed or ceased their portfolio purchases (and accompanying debt issuances). Unconstrained, Fannie and Freddie’s portfolio businesses served to limit how high MBS and mortgage yields could get relative to the cost of the companies’ callable and non-callable debt; that was a valuable function, and borrowers benefitted from it. Following the conservatorship, however, Treasury mandated that Fannie and Freddie shrink their portfolios by 10 percent per year (since increased to 15 percent per year) until they reach $250 billion. At their height in early 2009, Fannie and Freddie held a combined $1.65 trillion of mortgages in portfolio; today those same portfolios hold less than $600 billion. This trillion-dollar shrinkage very likely would have had a discernible adverse effect on mortgage rates, but it was more than offset by Federal Reserve purchases of Fannie, Freddie and Ginnie Mae fixed-rate MBS of even larger amounts. The Fed went from owning zero of these MBS at the end of 2008 to $1.75 trillion today. This, in my view, was no coincidence. The Fed knew that Fannie and Freddie’s holdings of mortgages and MBS added value to the system, and when Treasury made the companies shrink their portfolios the Fed decided to move in and more than take up the slack created by this mandated shrinkage. There is more than a little irony here. Fannie and Freddie’s opponents criticized their portfolio businesses by saying they took too much interest rate risk. Yet at the time they were put into conservatorship (and told to shrink their portfolios) both had maintained close to a perfect match between the durations of their mortgages and the durations of their debt for the previous twelve months, through a combination of hedging and rebalancing (i.e., changing their hedges as interest rates changed). The Fed doesn’t hedge its purchases of MBS at all; it funds all $1.75 trillion with what essentially is overnight money (bank reserves on which it pays interest). The Fed is taking enormous un-hedged price risk on its mortgage holdings, as well as the risk of having to raise the rate it pays on the bank reserves it created when making its mortgage purchases. Quite a contrast to the portfolio risk management standards to which Fannie and Freddie had been held. So, should Fannie and Freddie be allowed to get back into the portfolio business, without the constraints artificially put on them by Treasury? As much as it pains me to say this (I was responsible for Fannie’s portfolio business for 17 years), I still say no. The reason is the implicit guaranty. I believe it is easy for policymakers to justify having either an implicit or an explicit guaranty on Fannie and Freddie’s credit guaranty business (should they wish to do so), by requiring them to hold sufficient capital to withstand a specific credit loss stress scenario that THEY (the policymakers) define. That’s what I proposed in my Urban Institute essay, “Fixing What Works.” It’s much harder to come up with a comparable stress standard for the portfolio’s interest rate risk. You can have a required rebalancing rule—i.e., the companies have to lengthen or shorten their liability structures to keep the durations of those liabilities within a month or two of their (changing) mortgage durations—but you still will have both derivative risk (the possibility that large-scale moves by Fannie and Freddie to rebalance using derivatives triggers instability in the derivatives market that spreads to other institutions) and spread and liquidity risks in the companies’ debt (the possibility that their debt becomes increasingly more expensive, or even difficult to sell). I believe all these portfolio-related risks are remote, but they’re real. Thus, in order to make it easier to gain agreement on the secondary mortgage market system of the future, I think it’s much better to limit Fannie and Freddie’s portfolios to purposes ancillary to their credit guaranty business, and tie the implicit or explicit government guaranty to the stress standards that apply to THAT business. Truly eye-popping, re Fed’s mismatch! Amazing! You raise interesting points; I will ponder this for some time! Ever grateful for your expertise. many thanks! Is it possible the Gov can just turn the GSEs into Federal Agencies (like FHA and Ginnie Mae) thus continuing their mission, but in a more explicit Gov-guarantee way? It would require legislation to do that. So far no one in Congress has advocated formal nationalization as the preferred solution to the status of Fannie and Freddie, so at this point I would say it is unlikely. Any thoughts on why Pagliara dropped his appeal? This will set a bad precedent for the future and lack of transparency must not be the law of the land. No, I don’t know why Pagliara dropped his appeal; I haven’t followed the case that closely nor have I spoken with him about it. Perhaps a lawyer who sees your comment and has some knowledge or an informed opinion will share it with us. Great interview on the subject. Once again, demonstrates that there is one person in the $FNMA $FMCC saga that knows WTF he is talking about – Tim Howard. Tim – what are your thoughts on Mnuchin comments? I have been out most of the day (and am about to head out again) so have not had time to review any of the clips or summaries of the Mnuchin hearing. I hope to be able to do that this evening, or tomorrow morning at the latest. Having said that, there is nothing in the excerpt above that surprises me (although I’m pleased with his observation that he believes Fannie and Freddie have been well run). In particular, I view his comment that he never said there should be recap and release not as a statement of position, but as a simple statement of fact. If I were him, my goal at this hearing would be to be as neutral and non-controversial as possible, and just try to get confirmed. Then, he can address policy issues on his own timetable, to suit his own objectives and purposes. “If I were him, my goal at this hearing would be to be as neutral and non-controversial as possible, and just try to get confirmed. Then, he can address policy issues on his own timetable, to suit his own objectives and purposes.”…and in a process which he can be in charge of. mnuchin certainly is not in charge of his confirmation hearing. once in at treasury, it’s a different story. Mr Howard, Great interview on yahoo finance with Julia La Roche. I was curious if you have ever talked with Mr. Mnuchin in the past? I think it would be very beneficial if you did, or could set something up to just tell him your ideas and views of the past. as for the hearing- He played it perfectly in being neutral to get appointed. every Dem in the hearing tried to vilify him and he did a great job of justifying accusations. He also did great in not saying too much about FnF, simply saying essential what we want, without the wording of Recap and Release. Am I parsing this too thin by saying that Mnuchin saying that the GSEs shouldn’t be under government control and that releasing them is a priority and can be done swiftly does not imply “recap and release.” Another option in this saga has been referred to as “regulate, recap and release,” which has taken on a different meaning than merely “recap and release.” Also, the latter solution (3R) possibly lends itself more to a bipartisan resolution than does 2R. Even if that resolves any apparent contradiction, the docs will grease the skids. Moreover, not implying recap and release isn’t, as you note, a commentary on his position. Yes, it’s just a statement of fact. Mnuchin clearly said he knew GSEs too well. This implies this confidant man needs no “help” from Congress. His whole relevant talk is facts about GSEs and misleading opinion of expecting “bipartisan consensus” which will never be achieved. He also pointed out legal proceedings would affect his course of action. Anther great reason he’s waiting for. The conclusion: admin action “fairly soon” if no faster consensus from Congress. This positive comment matters, He knows what to do. He implied problem with FnF was fixable. Tim, what are your opinions, if any, of McLean’s account of Fannie Mae in her books, “Shaky Ground” and “All the Devils Are Here”? I was personally very impressed but I’m curious to hear your views. I thought “All the Devils Are Here,” by Bethany McLean and Joe Nocera, was the best of the books written about the financial crisis in the period shortly after it occurred (it was published in 2010). In my view Bethany and Joe treated Fannie and Freddie fairly, given the information they had about them at the time. Bethany’s subsequent book,”Shaky Ground,” published in 2015, benefited from new material made available to her (including my book, published at the end of 2013), and I thought it was even better. In addition to these two books, Bethany has done two magazine articles about Fannie: the first was a lengthy Fortune article done right after the 2004 “accounting scandal” titled “The Fall of Fannie Mae,” and the second was a Vanity Fair piece titled “Fannie Mae’s Last Stand,” published in February of 2009. If you read these as a sequence– starting with the January 2005 Fortune article, followed by the February 2009 Vanity Fair article, then “All the Devils are Here” (2010) and “Shaky Ground” (2015), you can see the evolution of both Bethany’s knowledge base and her opinions about what really was going on with the company. 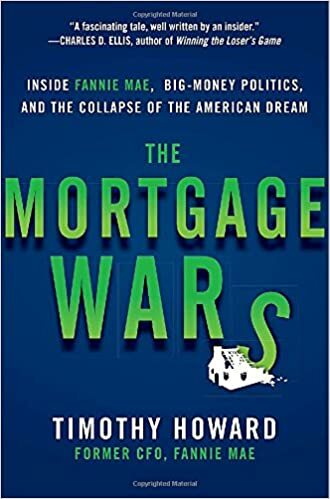 “The Fall of Fannie Mae” essentially was a recounting of the negative Fannie story as told by its critics; a lot of it was inaccurate, and overall the article lacked balance and perspective. All three of these–knowledge, balance and perspective–were notably better in “Fannie Mae’s Last Stand,” and they continued to improve in the subsequent two books. It would be good if all journalists had Bethany’s commitment to ferreting out the facts and writing objectively about them. That doesn’t mean to say I agree with everything she says about Fannie–I don’t– but I give her high marks for journalistic integrity.